iPad 2 not included with this WKB-2000CD. Keyboard Dimensions: 9.25 x 5.25 x 0.30" (235 x 133 x 7 mm). WKB-2000CB is for iPad 1 and WKB-2000CD is for iPad 2. This Bluetooth keyboard offers the freedom to use your keyboard anywhere and with other Bluetooth enabled devices. The silicone material used in this keyboard will protect it against spills and let you wash it regularly, to keep it germ free. Unlike other silicone keyboards, the rigid backing on the Compagno 2 keyboard provides a fast response, while the tactile key switches are almost silent. The Adesso Compagno 2 keyboard and case are design to make e-mail management, Internet browsing and other typing activities comfortable and productive. This case and keyboard combination provide the same great feeling of a laptop, so you can comfortably respond to e-mails, communicate on social media, and browse the internet for hours. The Adesso Compagno 2 case offers the flexibility to use case without keyboard, providing an additional viewing angle. Simply take out your keyboard and instantly you have a relaxing position to view slideshows, videos, and movies hands-free! This viewing position also keeps your iPad 2 securely in place, so you can safely use the touch-screen. 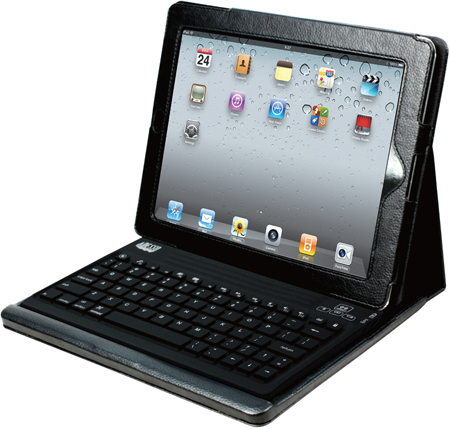 The Adesso Compagno 2 detachable Bluetooth keyboard and case are the perfect companions for your iPad 2. This sleek and stylish detachable Bluetooth keyboard includes a standard layout with iPad and Multimedia Hotkeys, to access iPad 2 shortcuts with one-touch. The keyboard is designed with a silicon material that protects it against spills and water, while also providing a fast and almost silent tactile response. A contemporary faux leather case accompanies your keyboard to protect your iPad 2 from the unexpected. This case not only protects, but it also provides multiple viewing angles for easier typing, Internet browsing, and video viewing. In addition, the Compagno 2 case design gives your two iPad 2 cameras full visibility and includes a magnetic closure that automatically wakes and sleeps your iPad when you open or close the case. 10.5" x 8.5" x 1.3"